If you are preparing to purchase or sell real estate in the Bluegrass Region of Kentucky, it is in your best interest to contact Chandler Home Inspections. When scheduling a home inspection, it is very important that you select an established and experienced inspection company to provide an educated evaluation of your biggest asset. Chandler Home Inspections has completed over 4,000 inspections and has been in business for a decade, so you can be sure to receive an inspection report that is accurate, detailed, and easy-to-understand. Property transactions can be confusing and stressful. The inspectors at Chandler Home Inspections understand this, and always available for you to explain their findings and answer your questions, whether during the inspection or after you have received your report. Chandler Home Inspections is experienced in inspecting properties all across the spectrum, from newly constructed homes and historic horse properties to condos and commercial spaces. 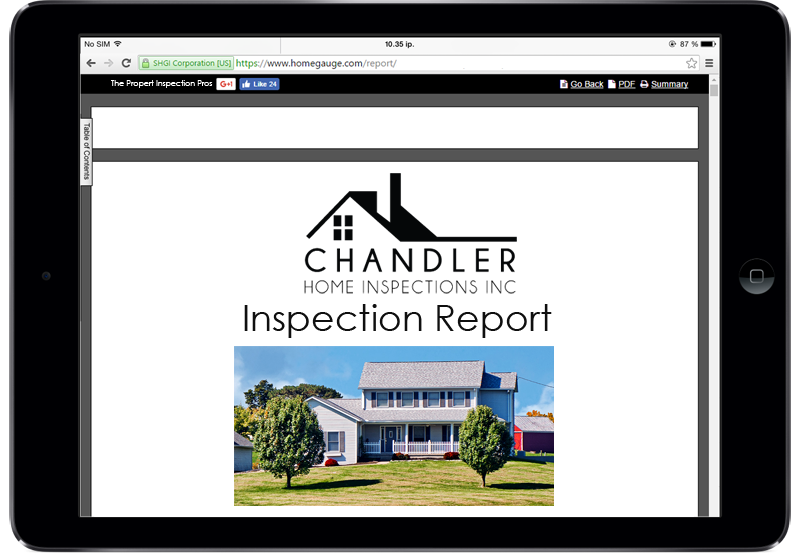 Instead of a huge pile of papers that can get misplaced and lost, at Chandler Home Inspections you can access your inspection report from any computer or mobile device easily by logging in on the website. Since a picture is worth a thousand words, each inspection report features many hi-res, expandable photos to elaborate on the condition of the components. Also included is the option to use a handy feature called the Create Request List (CRL) which allows for you to easily make a list of items found that need to be addressed and eases communication between all parties involved. The goal of Chandler Home Inspections is to assist you in having unbiased, factual information to base your decision on. With an extensive background in construction and home inspections, you can count on the inspectors at Chandler Home Inspections to thoroughly examine your home from foundation to shingles. Including but not limited to: Louisville, Lexington, and the counties of Madison, Fayette, Jessamine, Scott, Woodford, Mercer, Garrard, Rockcastle, Pulaski, Laurel, Clark, Lincoln, Franklin, Boyle, and other Central Kentucky counties. Discover the difference that experience makes, and request to schedule an inspection from Chandler Home Inspections today!